Be it Indian curries, Singapore Rice Noodles, Thai Curries, Chinese Chowmein, Fried rice or Biryani, no matter what cravings you have for Oriental food, Hungry Yeti will definitely bring an end to your woes. This is a one stop for diners who want to be treated to a wonderful diverse range of foods. Hungry Yeti oriental dining is surely reaching heights. The most wonderful thing, apart from the great food, is the way the buffet service is offered in a totally relaxed manner. From the buffet layout you are spoilt for choice and can choose from Indian, Chinese, Thai, Malaysian, Singaporean and Nepalese cuisines. 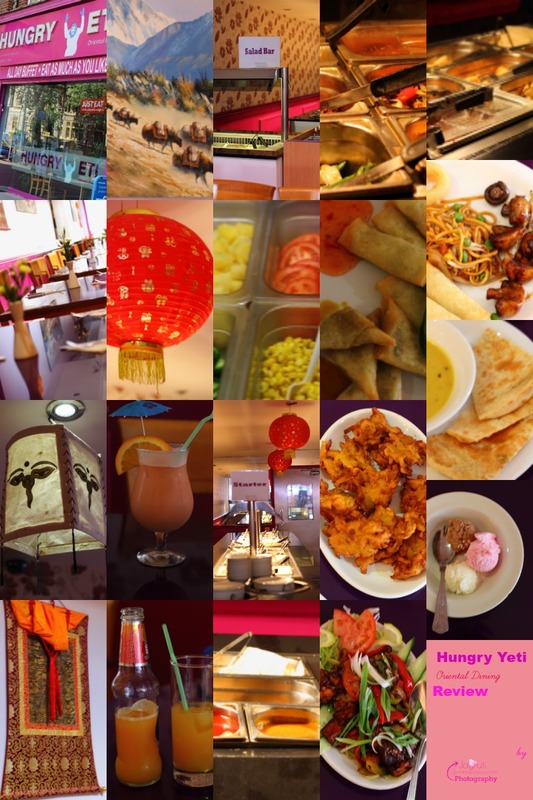 Hungry Yeti is located on the very busy Ealing Broadway. The restaurant stands out with it's Bright Pink board, with a tempting and welcoming sign "ALL DAY BUFFET - EAT AS MUCH AS YOU LIKE" which in my opinion sounds great on a hungry stomach, so choosing this dining place is a no- brainer. Walking into the restaurant we were greeted and welcomed by Diwas who led us to our dining area. The restaurant was so neat and colourful and we noticed the pink theme from outside continues in the inside as well. The interior was mostly pink and purple and beautifully designed too and made us think that this restaurant has a very continental feel about it. The restaurant has soft lighting and with it some peaceful music providing a pleasant, soothing ambience. The place has on offer a number of cocktails and mocktails , alcoholic and soft drinks. I opted for Passion Tropic which is a perfect combination of fresh and juicy strawberry, peach, pineapple and cream, With the first sip I abandoned myself in a tropical paradise, surely this drink brings tropical weather to your taste buds, ice cold, sweet , creamy with little bit of zing lends you lots of happiness. Coming to the food, as well as a healthy salad bar with basic salads, plenty of vegetarian and non vegetarian dishes were at hand on the Buffet layout which had simplicity. Plenty of space to walk through the clearly labelled buffet area and you can unhurriedly choose what you fancy. There were a few variety of salads displayed that included tomatoes, cucumber, boiled sweetcorn and olives. On the vegetarian side of things for the starters we went for mini vegetable Samosas, Spring rolls, Onion rings and Hash browns accompanied by Satay and Thai sweet chilli sauce. All the items that were on starter which we tried were of mild flavours and would suit everyone's palate , the thick and creamy Satay sauce was bang-on, it had a balance of hot, sweet, spicy and salty flavours. Complementary side dishes came along, these were some crispy Onion Bhajis and also Chilli Paneer. The Onion Bhajis were mild in taste and fluffy inside. The Chilli Paneer looked nice on the plate, it was garnished with lots of fresh vegetables and salads, but the paneer tasted like it was a bit smoky which is quite unusual. Moving on to the mains, a variety of veg and non veg dishes were displayed. We tasted Stir fried noodles and also stir fried mushrooms accompanied with Tarka Daal, Plain Rice and Naan Bread. Tarka Daal was perfect in texture and consistency but was unseasoned and lacked depth of flavour, rice and naan bread were offered warm. The stir fry texture was spot on and spiced perfectly. The mushrooms were stir fried in soy sauce and were succulent and we were blown away with it's taste and texture, this was an excellent dish and deserved a second helping. We ended our meal with a dessert which was a basic flavoured Ice cream. Overall, we had a great experience at Hungry yeti which buzzes with friendly and polite staff who offers great hospitality. Good range of food with many starters and mains which are prepared with fresh ingredients, well cooked, different flavours and textures, that suits everyone in the family and this place should be definitely visited for it's great food, drinks and relaxing ambience. All in all a fair price for a buffet meal ! Label dishes egg free if they are. Thank you emerz for arranging a review meal and Hungry Yeti for welcoming us to enjoy their hospitality. We visited Hungry Yeti, during lunch time on a weekday and some of the dishes are not available during lunch time except Sunday. If you are a non vegetarian , this place definitely offers more. All the views and opinions about Hungry yeti are my own. I was not told or paid to write positive review. The food was on the house. I think I've tried something similar but would love to make this! Need to find some mango powder too. Thank you Ivan, mango powder is easily available in any Indian Grocery store.